In August, 1765, a young woman by the name of Marie-Jeanne Valet was walking from her home to a nearby farm when she turned around and saw the enormous fangs and claws of the feared Beast of Gevaudan. Between 1764 and 1767, an unknown but terrifying beast stalked the residents of the region of Gevaudan, attacking and killing over a hundred people, and injuring more. The suspect: an enormous red-black wolf, preying on citizens who strayed too far from the safety of their homes. All-out battle was declared on the beast, with thousands of men seeking their chance to be the triumphant victor. Even King Louis XV was moved by the plight of the citizens of Gevauden, and sent his own hunters to the front. Antioine de Beauterne, gun-bearer to the king and leader of the hunt for the beast, recorded the story of how the king’s men were nearly shown up by a girl. In a sworn testimony recorded in 1765, Beauterne recounted Valet’s story of her near miss and attempt at killing the feared beast, which she described as looking like an unusually large dog. According to the account, Valet was crossing between branches of a river through a small wooded area when she turned to discover the beast immediately behind her. As it reared up for an attack, the young woman plunged a homemade spear she had been carrying into its chest. Injured but not dead, the beast raised a paw to the injury, crying out loudly, and then rolled off into the waters of the river. The beast was finally slain in 1767 by a local farmer, ending the reign of terror. This magnificent statue created by artist Philippe Kaeppelin memorializes the bravery of young Marie-Jeanne and was erected in Auvers in 1995. 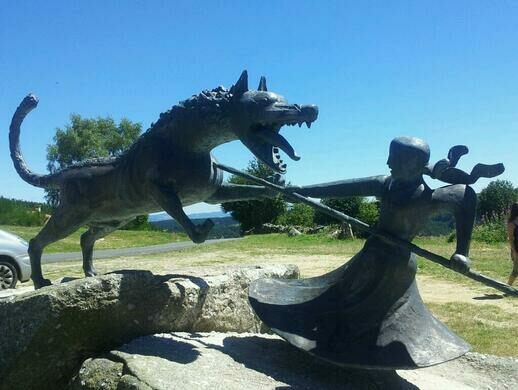 There are also sculptures of the beast in Marvejols and Saugues, and a monument to the beast slayer, Jean Chastel in La Bresseyre-Saint-Mary.